After assembling the carcase, I started milling and building the rest of the bookshelf. I milled the face frame and shelf fronts from a single 72″ section of cherry. 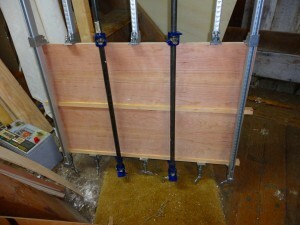 The shelf panels have a 1″ tall piece of 3/4″ thick cherry glued to the plywood. I decided to use a little taller piece of wood than the 3/4″ thick shelf. The wood will be flush on the top, and extend slightly below the shelf. Having a thicker piece of wood will add some rigidity to the shelves so they won’t sag under the weight of books. 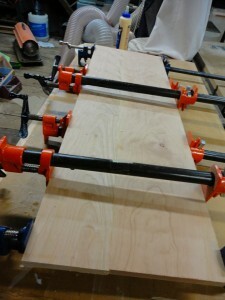 I glued up the top from two pieces of the cherry. I set it on the top of the shelves and it had a decent overhang and room to cut the board square. 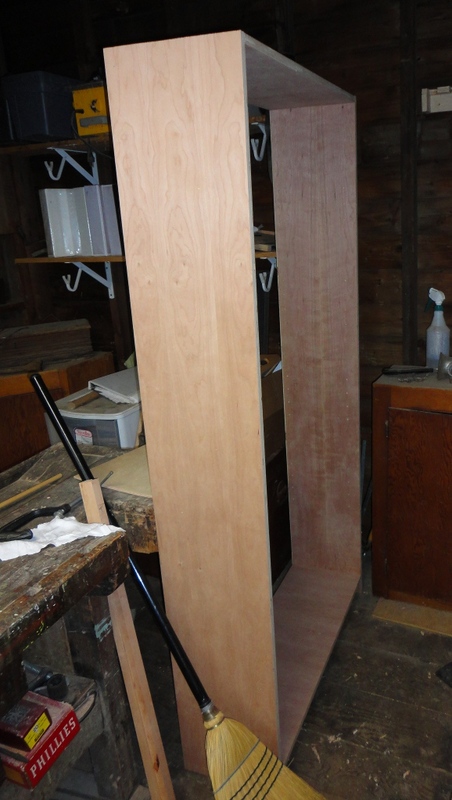 However I forgot that the bookcase will have a 3/4″ cherry face frame attached (Duh). Not sure if the top will be big enough. Luckily I have another piece (or two) of cherry milled that I can add to the top panel if needed. 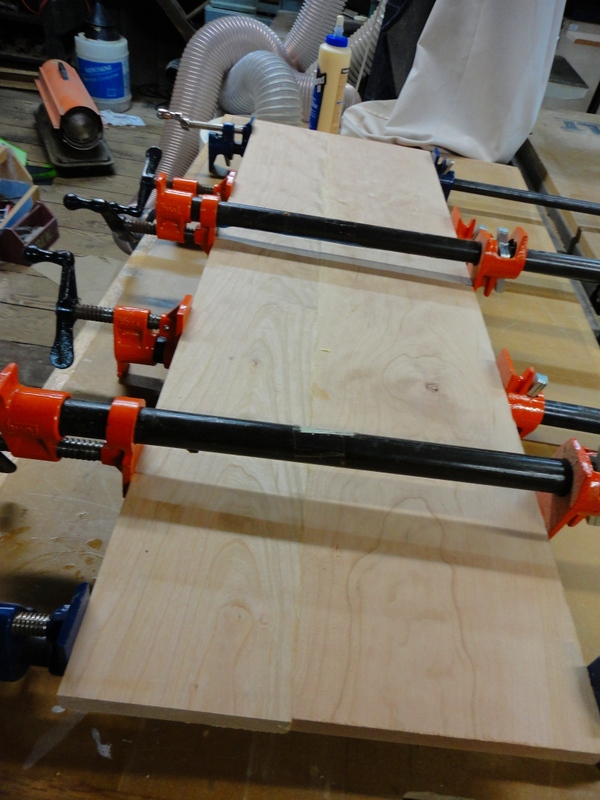 The edges to be glued were jointed on the power jointer. However the jointer didn’t leave the best edge for gluing (I think it needs new blades), so I used a hand plane to do the final jointing prior to glue up. The trick is to make sure both edges are perfectly square to the faces (that they aren’t on this panel can be seen by the very slight bow in the panel when I hold a straight edge across it. I’ll have to remember to keep checking the edges with the square when I use the hand planes… I’m hoping that the slight bow in the top will just be a design feature (either to cause water to run off the front and back – if the the convex side is up – or a place to store tennis balls where Tucker can’t get them – if the concave side is up). ← Low Cost Bookshelves (part 1).